It’s not exactly breaking news. There aren’t enough housing options for America’s mining, gas, and oilfield employees. So oil and gas companies are taking dramatic steps to room their crews near high-producing U.S. basins. Some are buying out hotels. Some are commissioning out-of-state construction resources. As with any kind of swift expansion, the workforce housing boom is posing unforeseen challenges. And questions about infrastructure, safety, and long-term investment don’t always have easy answers. Meanwhile, Falcon Structures’ modified, steel shipping containers are offering efficient, economical housing and storage solutions. Steel shipping containers check off all the boxes when it comes to oilfield housing challenges. They can be outfitted with every feature and comfort of a quality hotel room, but they aren’t contingent on availability, building permits, ground-breaking construction—or any of the countless hassles that come with traditional room rentals and building plans. Some oil and gas workers are circumventing local housing shortages by taking residence in outlying communities, and commuting to remote oil patches that lack onsite accommodations. This poses several concerns, according to city and state officials who have seen traffic on their roadways swell. In 2012, the Midland-Odessa Transportation Alliance released a report indicating that residents of the Permian Basin are now two and a half times more likely to be involved in a fatal car accident, as compared to all other Texas residents. In 2011, the Ward County, North Dakota population grew by 3.2 percent—an increase owed mainly to workers headed for Williston’s Bakken Formation. The U.S. Department of Housing and Urban Development noted the area’s growth in a report on oil and gas housing challenges, noting that the 125-mile (two-hour) drive is a significant viability concern during North Dakota winters. Why risk delays, accidents, and productivity loss when there’s an easy way to install all the housing and office space you need—directly on location? Most energy insiders concede that production is a gamble. Oil is an unpredictable field—literally—and especially as technology improvements allow access to highly productive “tight formations” and selective fracturing opportunities. Overall, the U.S. Energy Information Administration predicts increasing yields through 2015, but cautions that “sweet spots” will eventually decline at some unknown inflection point. After a 1980’s boom gone bust, one North Dakota town was left $28 million in debt—owed mostly to street and sewer infrastructure for residential development that didn’t materialize in time. The implications for workforce housing are clear. If you’re going to invest in camps and drill site facilities, they should be fast and portable. Ideally, you shouldn’t have to break ground. Falcon’s steel shipping containers offer the perfect solution. Falcon “boxes” come with hookups for plumbing and electricity, plus insulation and HVAC for climate control. Modified shipping containers are easy to transport, and no structural foundation besides a level surface is needed. Other workforce housing solutions that tout mobility are great as portable assets, but not so great as safe and secure structures. 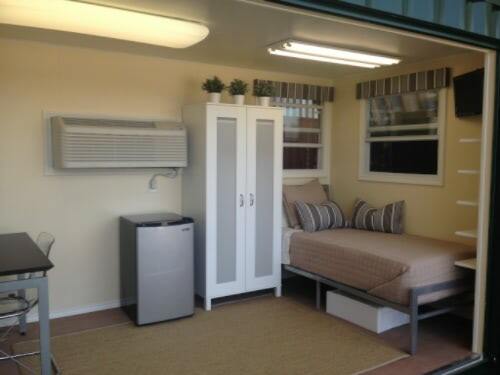 Mobile homes and prefab units aren’t usually built to withstand extreme weather conditions. And unfortunately, oil and gas worksites are plotted in some pretty wild weather corridors. From the torrential thunderstorms and tornados that brew in the Permian Basin, to the blizzards of North Dakota, to the Gulf Coast hurricanes and Appalachian Mountain squalls, there’s good reason to choose solid, watertight building materials for your next production site.